Here is a list of best free Facebook Video Uploader Software For Windows. These software let you upload single or upload multiple videos on Facebook. Now, you do not need to get online on Facebook or even open your web browser to upload videos to Facebook. Most of these software post videos to your timeline, whereas one of them lets you post video to Facebook Page, Group, or Timeline on Facebook. You also get options to select privacy option of the posted video as Public, Friends, Only Me, etc. Moreover, you can enter the title and description of the videos being uploaded to Facebook. Unfortunately, you cannot select an existing Album to upload video on Facebook. But, one of the listed software has option to create a new Album and upload videos to it. Apart from Facebook, you can also use some of these software to upload videos directly to YouTube, Twitch, Amazon S3, etc. In the following list, you will also find a software to broadcast live videos on Facebook. I like Movavi Share Online and Bloom the most. Movavi is a simple tool which lets you simply upload videos to your Facebook timeline. Bloom is designed specially for Facebook and lets you upload multiple videos. You can also set video privacy and even create a new album to add videos. Movavi Share Online is a free Facebook video uploader for Windows. Its a simple tool that lets you upload a single video, as well as upload multiple videos on Facebook. Not only Facebook, you can also upload videos directly to YouTube, Amazon S3, Vkontakte, and FTP servers. All it takes is logging in with the respective account on this software and selecting videos/folder containing videos to upload. You can upload all video formats supported by Facebook. These video formats include 3gp, avi, flv, mkv, mov, mp4, mpeg, wmv, etc. For each video that you add to the upload list, you can enter its Title, Description, and Tags. The videos that you upload to Facebook, will be posted on your timeline. The process to upload videos is same for other services. Before you upload a video, you will have to authenticate your account by logging in. 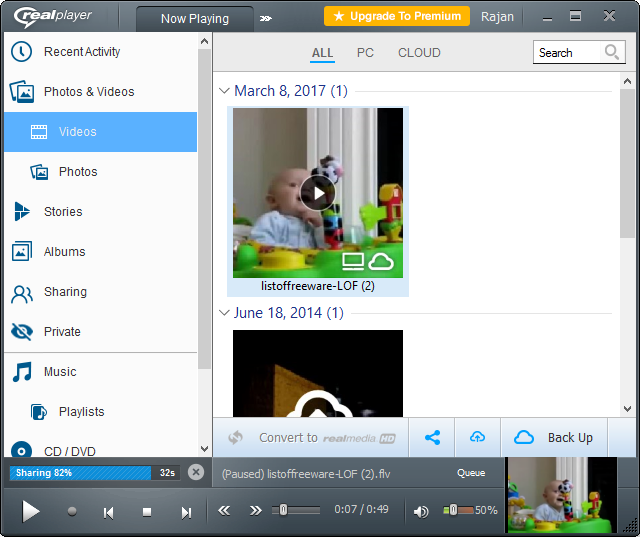 Movavi Share Online is a dedicated software to upload videos on Facebook, YouTube, Amazon S3, etc. A big limitation of this software is that you can’t upload videos to a specific Facebook album, neither you can set privacy settings for your videos. All the uploaded videos are directly posted to your Facebook timeline. RealPlayer is a famous media player and media manager software. It lets you create media library that you can store on RealTimes, its cloud service, and access anywhere you want. In case you want to share a video that you have added to RealPlayer library, you can do that directly from RealPlayer. RealPlayer also provides an easy way to upload video to Facebook. Select the video from your library that you want to upload, then click on the Share option. A small interface pops up,where you can add a description to your video and upload it. If you haven’t logged in to Facebook through RealPlayer, you will be asked to enter your Facebook login credentials. You can also upload videos directly from here to Twitter, send as mail, or get a direct link to watch the video. It supports and lets you upload almost all video formats supported by Facebook, such as: mp4, flv, mpeg, wma, mov, div, etc. Like Movavi Share Online, you cannot choose any album or privacy setting for the video being shared. It will be directly posted on your timeline with default privacy settings of Facebook. RealPlayer is an amazing media manager tool with tonnes of options. You can create video and audio playlists, sort your media collection, manage photos, and do much more. Bloom is a free Facebook video uploader software for Windows. Upload single as well as multiple videos on Facebook in one go using this software. It lets you upload and share videos on your Facebook Timeline. For a video, you can add its Title, description, and even set Privacy. You can select if you want a video shared with Public, Friends, Friends of Friends, or Only Me. You can even create a new Album and upload videos to it. You can upload videos of various popular formats using Bloom, such as: flv, mp4, wma, mov, etc. Do remember that, before you begin the process to add and upload video, you will have to login to Facebook. The free version of Bloom has certain limitations to it, but you can upload unlimited videos despite the limitations. You can only upload videos to your timeline. The pro version lets you upload videos to Facebook Pages managed by you. Bloom also lets you upload/download images but the limitations of free version restricts many features. Checkout the comparison between the free and Pro version on Bloom’s homepage. Video stored on your PC. You can add multiple feeds to broadcast scenes. You can even create multiple scenes and switch between scenes while broadcasting in real time. The Chroma Key feature lets you add custom background to green screen videos. You can manage audio inputs here as well; you can use both mic and audio input of video, and control their volume as well. When you are ready to broadcast, login to Facebook and start broadcasting. Under the Facebook settings, you can choose if you want to broadcast live video to your timeline, page, or a group. You can also set video and audio encoding according to your choice. Xsplit is available both in free and paid versions. The free version has certain restrictions, such as watermark on videos with resolution above 720p, only for non-commercial purposes, limited number of scenes, etc. Checkout the Plan Comparison to know more about the free and paid features here. 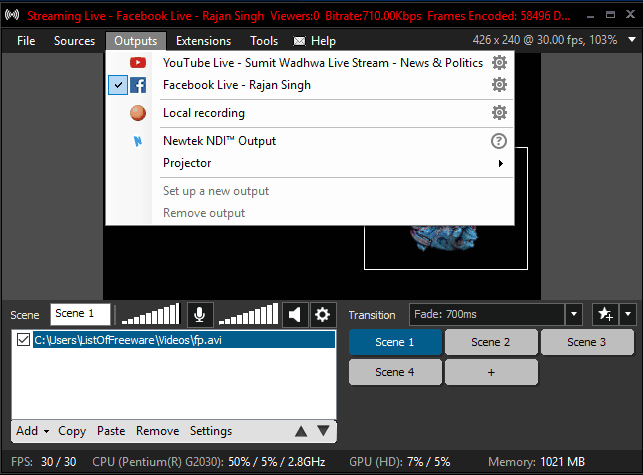 Xsplit is an extensive video broadcasting software with many options to make use of.